Use SystemTools Hyena software to manage all aspects of Windows System Management and Active Directory environments. Hyena was the first AD management product to support customizable Active Directory queries at every object level. 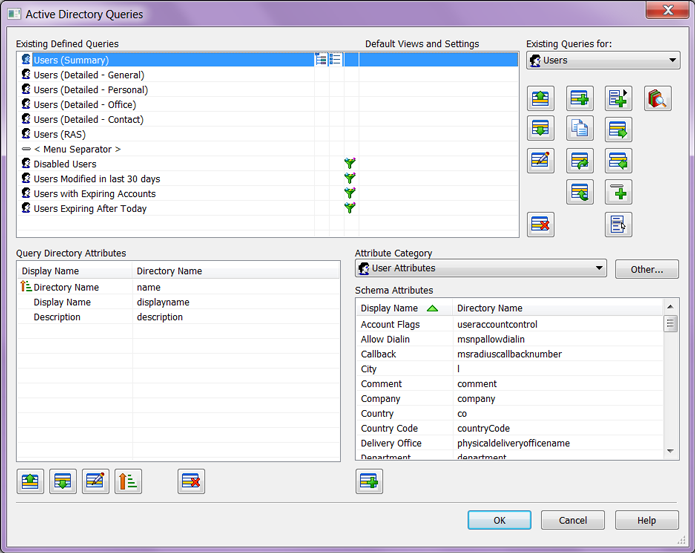 Define your own queries, or use any of the predefined queries to display custom 'views' of exactly what directory attributes you want to see for organisational units, users, groups, or computers. Hyena's queries can also contain a customized LDAP filter, if desired, for the ultimate in server-side AD filtering and query performance. The 'Active Editor' is a powerful spreadsheet-like directory editor that allows you to freely navigate around and change most common directory elements. Visual indicators show what attributes have been updated, the number of uncommitted changes, data validation, and more. The Active Editor also supports importing data into the Editor from a delimited text file. Changes that are imported are clearly indicated. Hyena's 'Active Task' component automates the tedious task of mass importing and updating Active Directory, without the need for complex and error-prone Powershell scripts. Take any input file and use it to create or update directory objects quickly and easily. Task settings and options are saved automatically, so repeated updates can be performed with minimal steps. See AD Importing for more information on importing using the Active Task. All of Hyena's query results, including all Active Directory displays, can be easily exported directly to external sources, including text files, the Windows clipboard, or Microsoft Excel. Hyena supports management of any version of Exchange including creating and disabling mailboxes, all in an easy to use and powerful GUI. Manage common Exchange account properties without needing to use another application. Plus, the Exchange Administration tools no longer need to be installed. If you'd like to have a chat with us about Hyena, please select this option. If you'd prefer to email or phone us, our details are also here.